On June 29, 2018, the Brazilian Navy (Portuguese: Marinha do Brasil) commissioned the multi-purpose helicopter carrier (Portuguese: Porta-Helicópteros Multipropósito) — PHeM Atlântico (pennant number A140), which is intended to replace NAe São Paulo (pennant number A12), a Clemenceau-class aircraft carrier in service with the navy, decommissioned on February 14, 2017 following multiple mechanical failures. 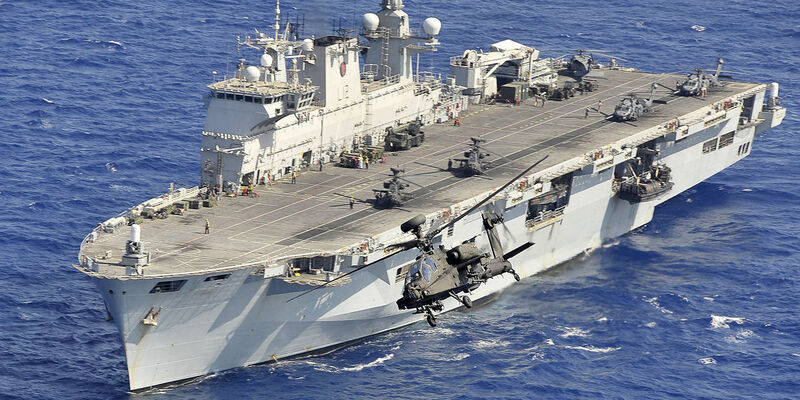 The 667ft-long amphibious assault ship with a staggering 21,500 tonnes displacement, was formerly operated by the Royal Navy as HMS Ocean (pennant number L12). It was UK's only helicopter carrier and the fleet flagship of the Royal Navy. She was constructed in the mid-1990s by Kværner Govan on the River Clyde and fitted out by Vickers Shipbuilding & Engineering Limited (VSEL) at Barrow-in-Furness prior to trials and subsequent acceptance in service. Ocean was commissioned in September 1998 at her home port HMNB Devonport, Plymouth and retired after 20 years of service and 50,000 nautical miles of deployment. It was purchased by the Brazilian Navy through a BRL381.081 million (US$98.76 million) deal on February 19, 2018. The sale of the ship was managed by the Defence Equipment Sales Authority (DESA), which is part of the UK's Ministry of Defence's procurement organization, Defence Equipment and Support. Babcock Marine and BAE Systems carried out the necessary modifications on the HMS Ocean before it is being transferred to Brazil. The ship is equipped with Artisan 3D E/F-band, a next generation medium range 3D surveillance radar — capable of operating effectively in littoral zones and improving air-defense, anti-surface (anti-ship) and air traffic management capabilities. Also, it comes with two Kelvin Hughes KH1007 surface surveillance and aircraft control radar systems, four MSI-Defence Systems' 30 mm DS30M Mk 2 remote weapon systems and four Mk 5B landing crafts for littoral operations. Six modular weapon assemblies for the FN Herstal's MAG58M 7.62 mm machine gun were purchased to complement other armaments such as the Kongsberg's AGM-119B Penguin MK2 MOD7 Anti-ship missiles and the Raytheon's Mk 46 Mod 5A torpedo system. Before being transferred to Brazil, these new weapon systems replaced the six-barrel 7.62 mm M134 machine guns, three General Dynamics's 20 mm Mk 15 Block 1B Phalanx close-in weapon systems, and the ship's original Surface Ship Torpedo Defence (SSTD) system. The ship will house six Brazilian Navy's Sikorsky SH-16 Seahawk multi-role helicopters (a local designation for S-70B) for anti-submarine and anti-surface warfare (ASW/ASuW) roles. The aircraft was previously cleared for operations from the NDM Bahia (pennant number G40) landing platform dock (LPD) acquired from the French Navy in 2015. 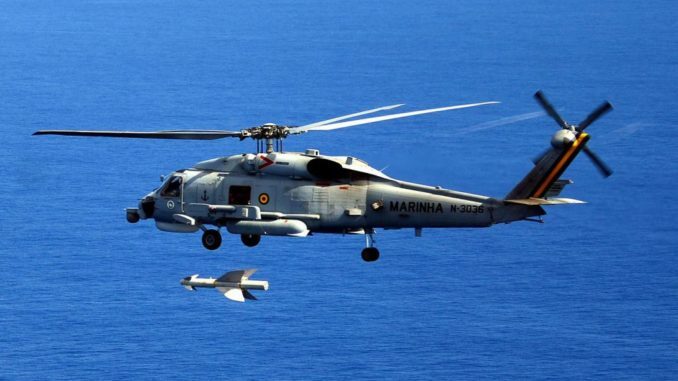 Image Attribute: Brazilian Navy's Sikorsky SH-16 Seahawk multi-role helicopter in flight. These helicopters are operated by the "Guerreiro" HS-1 Squadron of the Brazilian Naval Air Base of São Pedro da Aldeia. The squadron has already acquired more than 5,000 flight hours in this type of aircraft. Ship's propulsion is provided by two Crossley Pielstick 16 PC2.6 V 200 medium-speed diesel engines, rated at 23,904hp, with two independent shafts and a five-bladed fixed-pitch propeller. A 450kW KaMeWa bow thruster is fitted. The maximum speed is 18kt and the range is 8,000 miles. The ship and its new crew will go through Royal Navy’s Flag Officer Sea Training (FOST), a Royal Navy program tailored to meet the specific national requirements of many other navies, air forces and elements of land forces. The syllabus is framed around NATO doctrine and is aimed at delivering Royal Navy standards. The ship is scheduled to reach its homeport, Arsenal do Rio de Janeiro (AMRJ), on August 25, 2018.